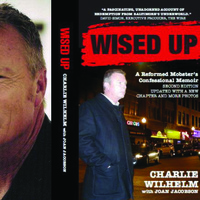 Wised Up is the confessional memoir of career criminal Charlie Wilhelm who turned FBI informant to expose organized crime in Baltimore. Charlie ended his life of crime the year he turned 40. He went undercover, wearing a wire to catch his life-long friends for arson, drug dealing, bribery, loan sharking and murder. In this 2nd edition of Wised Up, a new chapter takes up where the original Wised Up left off when it was first published in 2004. Find out what happened next in a conversation with authors Charlie Wilhelm & Joan Jacobson. Charlie Wilhelm is a carpenter who renovates houses in Baltimore and dotes on his eight grandchildren in his spare time. Joan Jacobson was a reporter for the Evening Sun and Baltimore Sun for 28 years. She met Charlie in a courtroom when he testified against his best friend for a long unsolved murder. Copies of the book will be available for purchase at a book signing following the program.